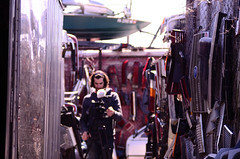 Last December we traveled to Philadelphia to film the Bilenky Junkyard Cross race. An incredible event that is as much a Bilenky Cycle Works open house and holiday party as it is a race. The race footage from that day got a lot of play on the Internets, which was really cool. About a month ago we decided it would be even cooler to head back to Philly, hang out at Bilenky Cycle Works for a day, grab some shop footage and some interviews, and put together a more developed short film on the annual race. We spent a super fun day talking about the race and playing in the junkyard. Stephen Bilenky was nice enough to come to the office on a Sunday. The completed short film is now in the hands of the Bicycle Film Festival. Hopefully, they will deem it worthy to be included in their shorts program. Sean O’Donnell, who races for TOMS Shoes p/b Kindhuman Sports, was a huge help in putting the film together. He is also a talented photographer who is turning out a ton of sweet bicycle culture photos for his Smoke to Ink Photography mark. Check out the nice set of shots from our day up in Philly here. Courier Cross. DC. May 15. 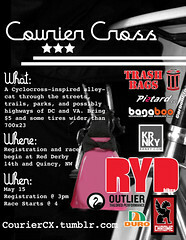 And, hey, if you’re not doing anything May 15 and want to try your hand at some urban cyclocross/alley cat mayhem, Sean is promoting the first annual DC Courier Cross. We will be out there filming the chaos. You should come out, too. All the details are here.